Whenever possible you use the versions of websites which are protected with HTTPS. But sometimes you do not know whether a protected version of a site is available. 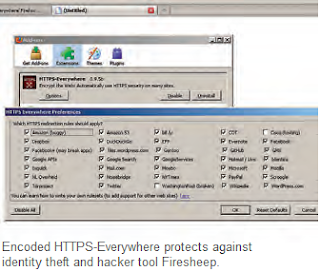 With hacker tools like Firesheep readily available, it becomes easy even for a layman to break into unsecure HTTP sessions on many websites. There is a high risk on many big web portals or pages of a social network through such an identity theft. Thus such sites must be used only with encoded HTTPS connections. You can use free browser updates like HTTPSEverywhere, to automate the safe encoding process as far as possible. Go to www.eff.org/https-everywhere and grant the required permission by clicking on ‘install now’. Restart Firefox. The tool is automatically activated and requires very little configuration. Firstly open the command ‘Tools | Add-ons’, and click on the respective ‘options’ button. You will see an overview of all the present unprotected websites. It contains important portals like Google Search, Microsoft, Mozilla, Twitter and Facebook. You can deactivate rerouting for a particular website, if there are problems with the protected connection. For instance, if you buy often at Amazon, you need to activate the option ‘Amazon (buggy)’, so that the access on the pages of the online store takes place in the encoded form. Finally confirm the dialogue with ‘OK’. Rerouting to the encoded websites takes place automatically; you need not enter the special HTTPS address.